The terms ‘socialism’ and ‘communism’ are 2 of the most misused in public discourse, so let’s clear things up. Firstly, socialism is misapplied to what is more accurately described as ‘welfare capitalism’ or ‘when the gov’t does stuff’ (aka ‘social democracy’). This is a pretence of socialism which aims to forestall genuine working class power, and aims to maintain a class of billionaires in their position. In this system, the billionaires are willing to compromise on some social policies and provide just enough social security to keep the working class profitable and relatively docile, using superprofits from fascistic oppression of the 3rd World (like how the British Labour Party used concentration camps and massacres in Malaya to exploit tin and rubber resources, while instituting the NHS at home). Politicians such as Jeremy Corbyn and Bernie Sanders are not, in fact, socialists (as the capitalist media like to portray them), but purveyors of this imperialist welfare capitalism couched in radical-sounding rhetoric. Both ‘socialism’ and ‘communism’ apply to both an ideology and a social system. Referring to an ideology, they can be used almost interchangeably, thus I’m a socialist *and* a communist. There is a difference, however, when it comes to social systems; so, the USSR was both socialist and communist in ideology, but only socialist in terms of system, and not communist. Historical materialism enlightens us here: slave societies like Ancient Rome led to feudal societies where peasants worked land on behalf of their Lord. This led to capitalism – where wage-labour prevails and the bourgeoisie (or ruling class) own the means of production (i.e. all the facilities and resources for producing things, like factories) and confiscate surplus value (i.e. the result of the work we all do. We are allowed to keep only a fraction of the product of our labour, in the form of wages. The rest of what we produce, or surplus value, benefits the owner/capitalist, who does not need to labour at all) in the form of profits from workers. 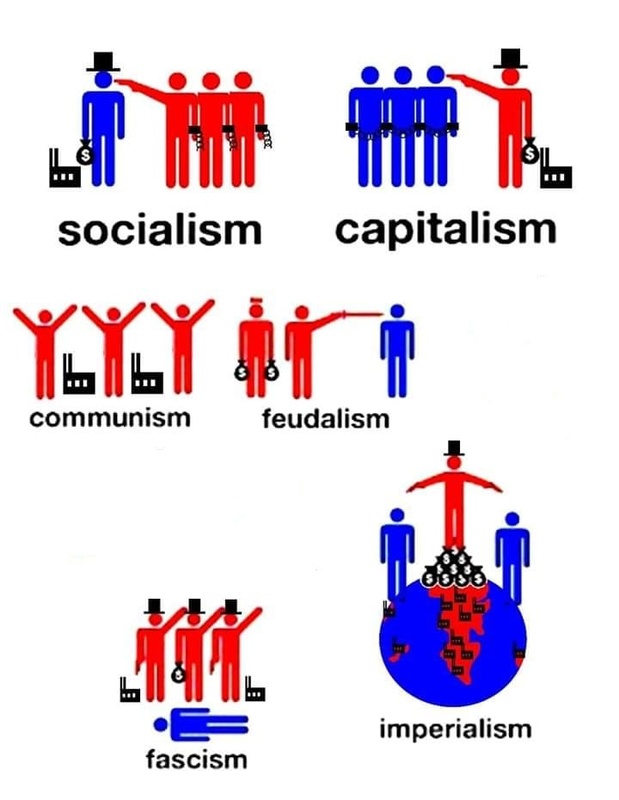 In this system production is aimed at the exchange of commodities, rather than for human need (hence why 20,000+ starve to death every single day in a world which produces an overabundance of food), and a tiny percentage of the population form a ruling class that owns pretty much everything, while everyone else must work on their behalf or face a life on the streets or, ultimately, starvation. Vladimir Lenin analysed how capitalism had reached an advanced stage he termed ‘imperialism’, whereby a small group of rich capitalist nations (i.e. the European colonial powers and Britain’s settler-colonies) divided up the world between them and superexploited the resources and labour-power of those nations they controlled – this is still true today for most of Asia, Africa and Latin America, although the emphasis is less on direct colonial control and more on control through economic weapons like debt traps, ‘structural adjustment programmes’, installing puppet (or ‘comprador’) rulers and arming them to the teeth to maintain their power. Capitalism has spawned the ideologies of liberalism (with its right and left wings: conservatism and social democracy respectively) and fascism. The lines separating these ideologies are blurred and porous as they are best seen as a conglomerate, and whether one strand of liberalism gains dominance over another mostly depends on how healthy profits are overall. Fascism is a tool employed by capitalists in the imperial core when they hit severe crisis, when there’s no room left for social democracy, and force becomes the main tactic of control (a tactic they’re already employing directly or indirectly elsewhere in oppressed nations). Socialism is a progression from capitalism via revolution where the working class takes both political and economic power into their own hands. They expropriate the capitalists and produce for human need rather than purely for commodity exchange and profit. Socialist societies such as the Soviet Union and Cuba have demonstrated that an end to homelessness, food insecurity, and unemployment is possible and have additionally provided universal healthcare and education, and leaps forward in living conditions for the entire population. Karl Marx saw socialism as ‘the lower stage of communism’, and best seen as a transitional stage between capitalism and the higher stage of communism. Thus, there is some overlap and the characteristics of capitalism have not necessarily been done away with completely in Actually Existing Socialist states (for which they are berated endlessly by purists). Communism as a socio-economic system has not yet been achieved and isn’t likely to be possible until the imperialists have been decisively defeated. Communism would represent a further progression from socialism where virtually all human needs could be fulfilled and racism, ableism, poverty and patriarchy could all be abolished. While in socialism workers receive according to their ability (contrary to the myth that ‘everyone receives exactly the same salary’), and so work which requires more skill, training, and/or risk/danger will obtain more reward, and vice versa. In communism, this is no longer necessary, because there is an abundance of pretty much everything. Advances in technology and an end to the artificial scarcity inherent in capitalism mean that everyone has access to the same things, and so ‘to each according to their need’.